Our group planned leave time was for 8am this morning, but a handful stayed up quite late last night talking and drinking, so we ended up leaving at 8:45am. Although I don’t partake, a big plus for hikers on the river section is that since weight doesn’t matter, they can bring alcohol. This group is really responsible with it, but since the prior night at Tieke Campsite was a dry campsite, there was some extra to get rid of. I was camped well away on the beach, so I was only impacted by having to wait for 45mins this morning. Not bad at all considering how difficult it can be to get 16 people on the same schedule. This group is so cheerful that many of them took the extra time to do a morning yoga session together. There weren’t too many eventful things today. 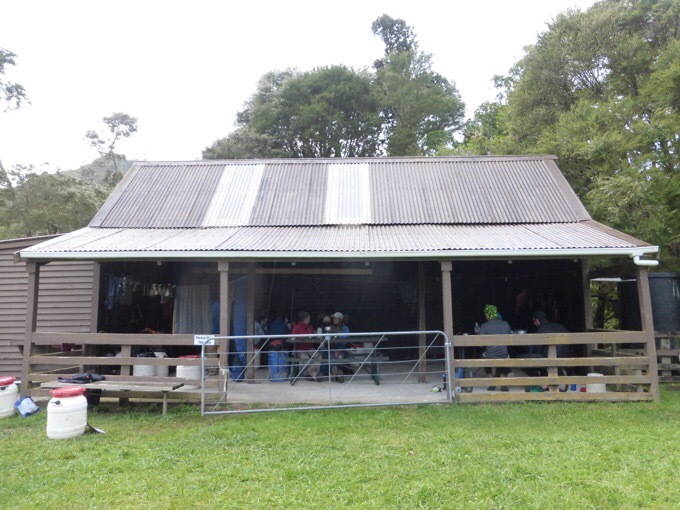 Early on, we stopped at a Marae, which to the best of my understanding, is an old village home to native iwi with some homes, a church, and a meeting hall. 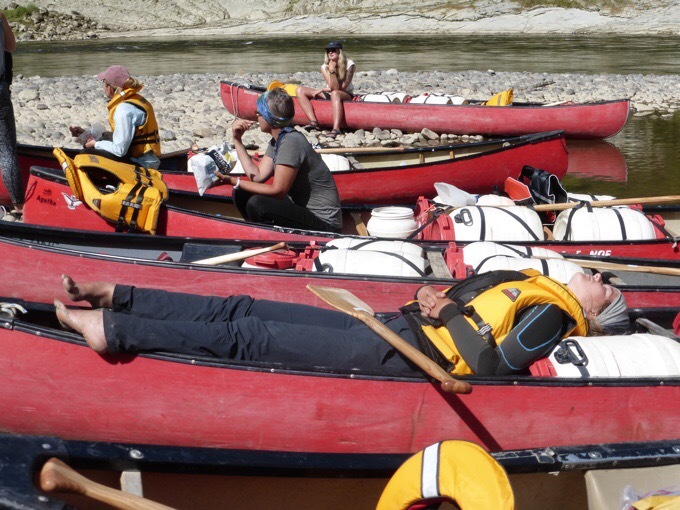 It was a bit of a walk up to it and most of the group chose to rest by the canoes as it was still early in the morning. The group that went said they weren’t able to go inside, but could see some of the carvings and historical items through the windows. I think it’s normally open, but we may have been too early in the morning. Becky taking in the last moments of sun as clouds rolled in. We had more miles to cover, and the water was quite calm, and there was some headwind to contend with, so the day seemed to go by slower. We got our first light rain just before lunch, but it wasn’t too bad. With the wind, I couldn’t put the umbrella up, but it sat nicely over my legs and kept them dry. 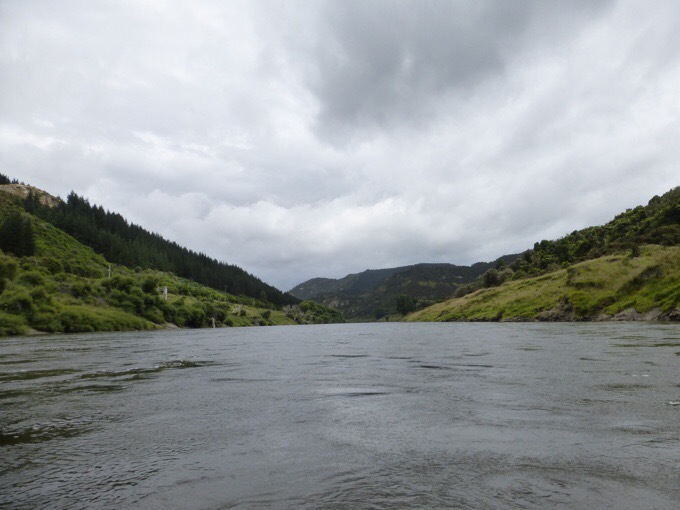 This group has done a great job of being a unit, but with this being our fourth day on the river, and the exciting rapids behind us, the novelty of canoes had worn off and some boredom set in. A much more relaxed position after yesterday for Becky and Frits. We stopped for lunch at Downs Hut, which was a 200m walk up a hill. Half the group went up there with looming clouds, and the other half stayed by the boats. I stayed down low figuring that I had the umbrella if needed. 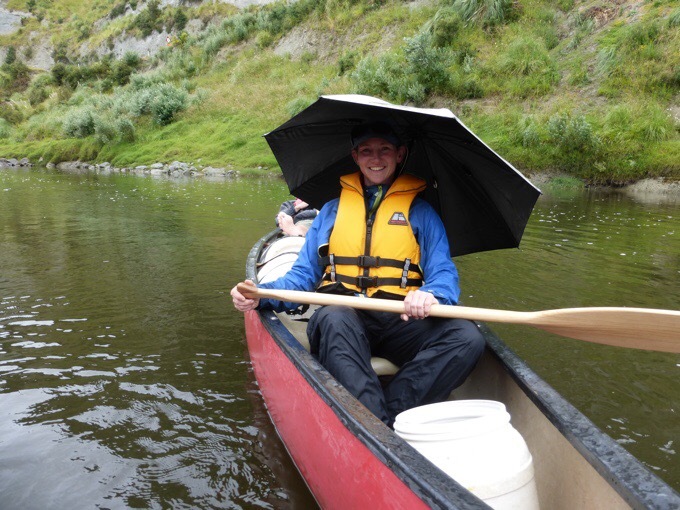 At the end of lunch, the rain came down steadily, and we all headed off quickly to at least paddle and be warm while it rained. The wind had stopped, and I got to use the umbrella. It fit perfectly in the front of my life vest and totally worked! It rained a bit on and off the rest of the day. There are 3-4 of us that tend to be up front and paddle a bit more, but the group is usually within a few minute span of one another and we still stuck together. The final push to our campsite had more wind, rain, and calm water, so it was a bit of a slog. Just to pass the time, we did word games that you’d only do when really bored, ha! Heartbreaker, Frits, Becky, and myself did an alphabet game for a good 40mins where you say you’re going to the store to buy something and you list items alphabetically with each person adding an item. So, on your turn, you’d list what everyone had said previously and then add the next item alphabetically. For example, “I went to the store and bought Apples, blueberries, cranberries, Doritos….” Sofie and Lisette tend to be up front with us as well, and there is a number game we play to pass the time. Someone yells out “ONE” and someone else needs to yell “TWO” without yelling at the same time as another person. The goal is to get to 10 (or as high as you can get) without two people saying a number at the same time. If two people yell at the same time, a random person yells “ONE” and it starts over. In this big canoe group, its become a thing that someone randomly yells out “ONE” whenever there’s a lull. Becky and Frits did the one where you give a name like “Susan” and the other person has to think of a name that starts with the last letter of that name, like “Nancy.” Just anything to pass the time. The one thing I’m going to look for when we get to town are more games like these to pass the time on road walks as well. We stayed at Hipango Park, which is a free field to camp in that has toilets, picnic tables, and a great covered area to gather under. It continued to rain lightly on and off the rest of the night. 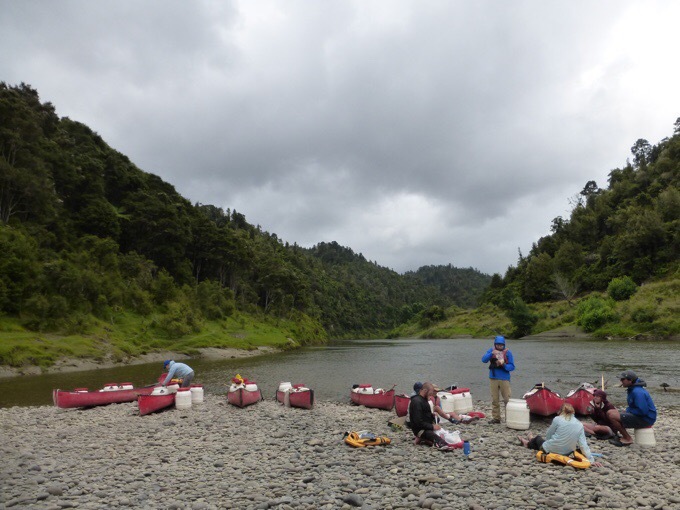 When we got there, there was another group of 6 TA walkers there as well, so we had a group of 22, and no other outside campers since most that do the Whanganui River Journey end further up river. It was great to have the covered area to gather, and it was another fun night together with some staying up much later than others. 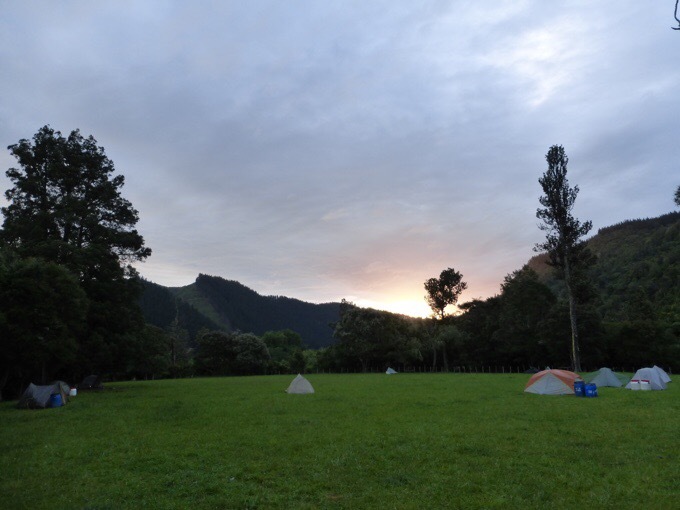 I camped as far out in the field as I could get to avoid the late night sounds and snoring. For some reason I’m feeling slight nausea from the canoe today. It may have been the waves against the wind, but I wasn’t able to eat most of dinner and fortunately had no problem passing it off. I feel like I’m just rocking back and forth on a boat. 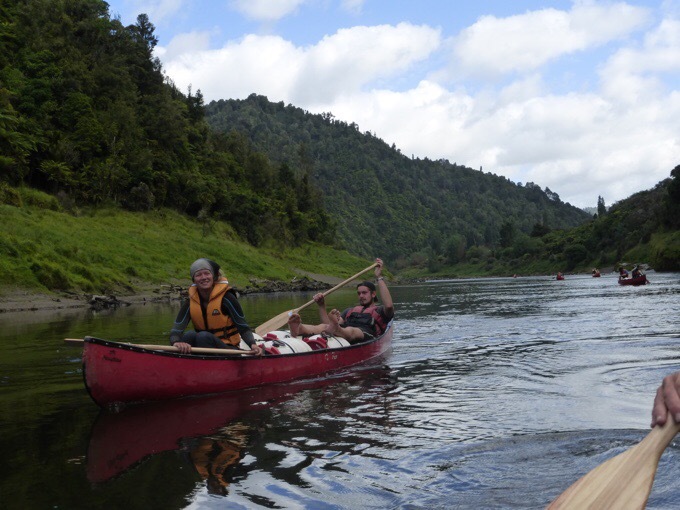 Tomorrow, we have just a couple hours left to paddle to Whanganui where we have decided to all celebrate Christmas together with a Christmas Eve dinner at the Holiday Park. We will be getting an early start to maximize the day, so I headed to bed early. You are quite the expert now with your umbrella. I’ve thought off and on about getting one. They seem to have multiple uses but escaping the direct sunlight sure looks good. 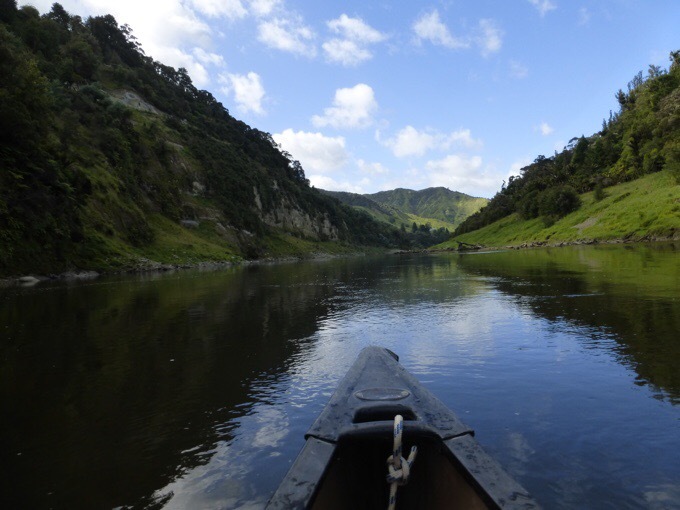 What a beautiful adventure there…Merry Christmas to you as it is now Christmas Day in NZ…I hope you have a “doubly perfect” day with your “family”! Ahh! Two in a row!!! Great use of the umbrella in the life vest. 🙂 Hope you have a great holiday! That river looks like a good place for an umbrella. Snowy/rain yesterday morning in this desert so I took my crome out for a walk in your honor and now the neighbors know im a nut. Seems to me everyone should own at least a couple incase one gets lost. Merry Christmas to you and all your trail families. Haha! I just used mine all day on a road walk and through town! 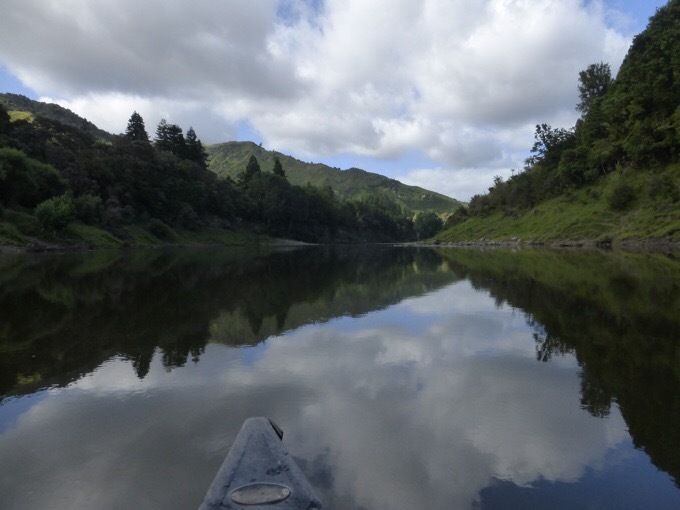 How did you find the paddling in terms of aches and pains? You had concerns at the start of the river and I wondered if it was ok in the end, or are you still recovering!!? Erin, that feeling of the boat motion will linger for a couple of days after you get off the river. But it will pass. I used to get that sort of feeling after a day at the beach in the surf.. seemed like the motion and sound of the waves would stay with me for awhile. We are having a ? sunny bright Christmas day after rain and wind. Hope your group is having a great celebration. ?⛺?? I did the Bowron Lakes circuit in central British Columbia many years ago and had motion sickness. 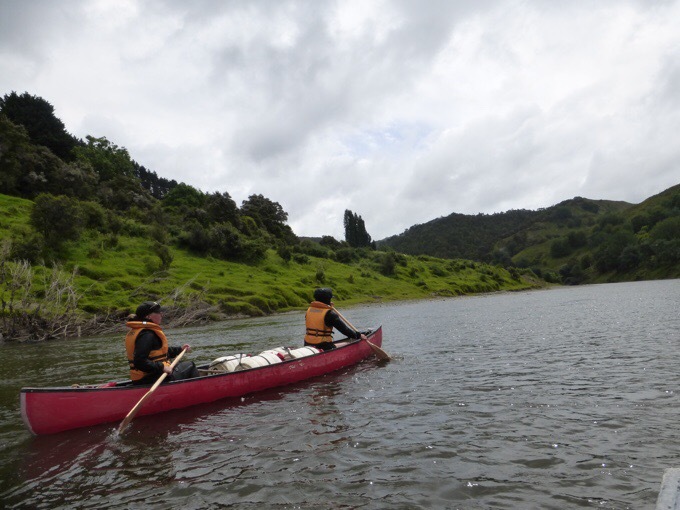 I suffer from motion sickness at times when I’m flying or as a passenger in a car but I never thought that I would suffer when paddling a canoe. I took gravol at night. These days I wear sea bands whenever I travel. They have saved my life and made travel more enjoyable. A belated Merry Christmas. I’m worried about the 2hr ferry over to the S Island and may take something.